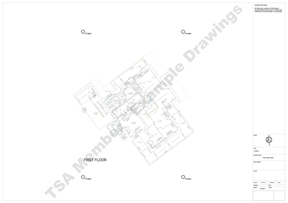 This is a typical measured building floor plan survey with indications of where the elevations have been taken and their relevant identification. Commensurate to 1:100m plotting accuracies. 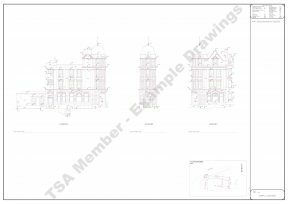 This is a typical elevation survey that relates to the above floor plan showing the indicated detailed elevations. Commensurate to 1:100m plotting accuracies. 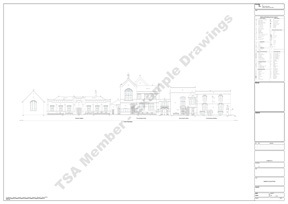 This is a typical elevation survey of a University Library building. Commensurate to 1:100m plotting accuracies. 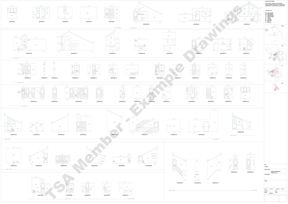 This is a typical internal elevation survey of various rooms within a Ski Chalet. Sheet 2 of 2. Commensurate to 1:50m plotting accuracies. 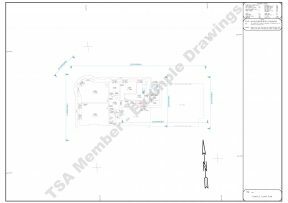 This is a typical measured building floor plan survey of the Ski Chalet first floor. Commensurate to 1:50m plotting accuracies. 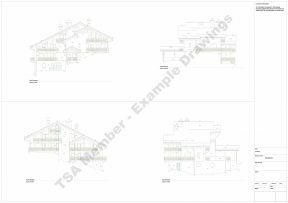 This is a typical external elevation survey of a Ski Chalet. Commensurate to 1:50m plotting accuracies.